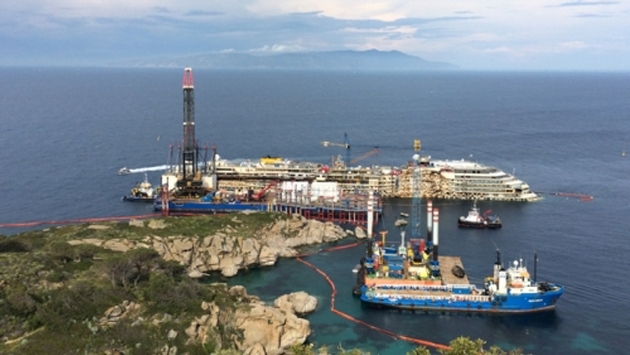 The wrecked hull of the Costa Concordia could be refloated and moved from the Italian island of Giglio by July 19, according to the latest estimate from the salvage team. Previously, it was hoped the hull could be moved in June. “However, as always in a project of this complexity, this should be intended as a goal and not a definitive date,” according to an update from the salvage team through its public relations representative in Italy. Currently, the project is installing “sponsons,” which are large tanks applied to the side of the wreck to help refloat it. So far, six of 15 sponsons have been installed on the starboard side and 11 on the port side. The salvage team estimates the project is 86.3 percent finished. Work was delayed earlier this month when one of the sponsons tilted out of alignment after getting hung up on a chain. That tank was removed and sent to Genoa, Italy, for repairs. The Costa Concordia capsized on Jan. 13, 2012, after striking a rock as it sailed near Giglio Island. Thirty-two people were killed. The removal — considered the biggest salvage ever attempted on a ship of this size — is being overseen by Titan Salvage, a U.S. company specializing in the recovery of wrecks, and Micoperi, an Italian company specializing in engineering and installation of offshore structures and undersea pipelines. The entire project is estimated to cost well over $800 million. On Sept. 17, the wreck was rotated upright during a meticulously orchestrated, 19-hour operation. The hull now rests on a specially built artificial sea bed and is still partially underwater. The sponsons will be used to refloat the vessel so it can be towed away. Once refloated, the wreck will be prepared to be moved to a port for dismantling and recycling. Where exactly the ship will go has not been determined, but there are several places vying for the job, including the Tuscan port of Piombino, believed to be the closest port to Giglio, and 10 ports and consortiums from six countries including Turkey and China, according to a story in the New York Times. How exactly the ship will be moved to its dismantling port also has yet to be finalized. It could be towed. Or, it could be loaded onto the massive Dockwise Vanguard, the world’s largest semi-submersible ship, which can lift and transport extremely heavy cargoes in a dry and safe manner. Costa and the salvagers will decide on the best option after its destination — and its distance — is determined. Those interested in this massive engineering operation can view photos and read detailed plans the salvage team’s website.